At FCMB, we understand that our business decisions and the methods by which we engage our key stakeholders affect not only our organisation, but also in a profound way, the communities and environment that support our lives and businesses. With this firm knowledge and a determination to ensure that our efforts to meet the needs of the present do not deprive future generations of their ability to meet their own needs, our Corporate Social Responsibility strategy demands that we run our business in a responsible manner while simultaneously ensuring long-term sustainability. We are committed to adding value to all our key stakeholders in the spirit of “My Bank and I”. Our CSR Philosophy- Include the CSR Led Graphics. We believe that the communities in which we operate should benefit from our presence. We operate an inclusive strategy and therefore encourage our employees to volunteer towards community activities that align with our CSR pillars. In practice, our philosophy is about our commitment to the wellbeing of our employees and key stakeholders. We are committed to building long-term relationships with our customers, partners, governments and communities and contributing to their sustainable development. 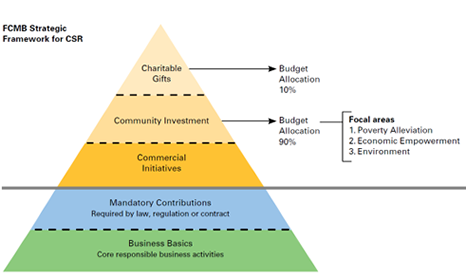 This requires integrating CSR into all business decisions, stakeholder engagements, monitoring, evaluations and reporting. Our CSR initiatives are focused on investing in the communities in which we operate and are implemented through strategic projects designed to maximise impact and ensure positive, long-term sustainability. FCMB’s CSR agenda is focused on Poverty Alleviation, Empowerment and Environmental Sustainability. Outside of these, FCMB supports a limited number of charitable projects. 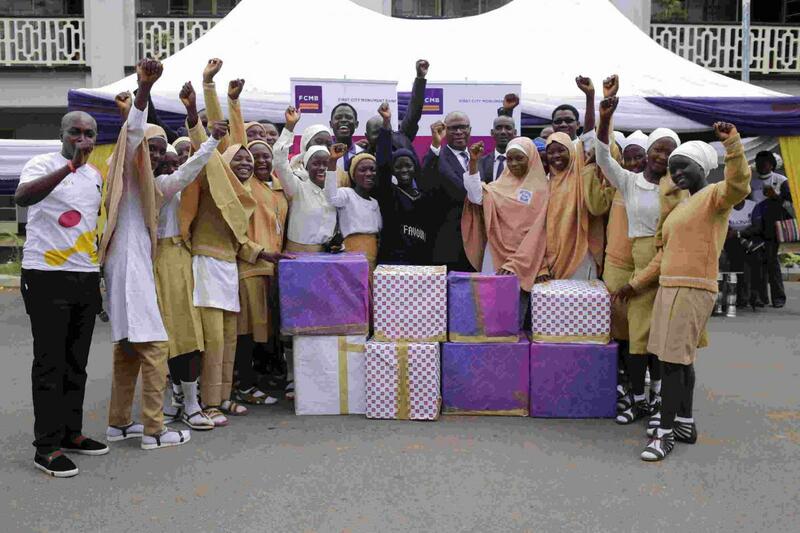 No fewer than 5,000 students have been impacted by FCMB’s donation of solar-powered lanterns to some selected secondary schools in Kaduna State. The aim is to positively impact the lives of the students by ensuring they enjoy constant power supply in their dormitories, especially at night (10pm to 5am). This way, they can study better and develop a stronger learning culture, paving the way for a secured future through education. This initiative is one of the different ways we are contributing to the alleviation of poverty, as well as the drive to attain the Sustainable Development Goals number 1 (No Poverty) and number 4 (Quality Education). The lanterns were handed over to the beneficiaries at an event which had in attendance: the Permanent Secretary, Ministry of Education, Science & Technology, Kaduna State, Mrs Kande Nana Bage; Permanent Secretary, Ministry of Local Government Affairs, Kaduna State, Alhaji Adamu Mansur; Regional Head, Business Banking Group, Mustapha Lukman; Zonal Head, Business Banking Group, Gambo Wuryo, as well as the principals and students of the beneficiary schools who were overjoyed at FCMB’s gesture. 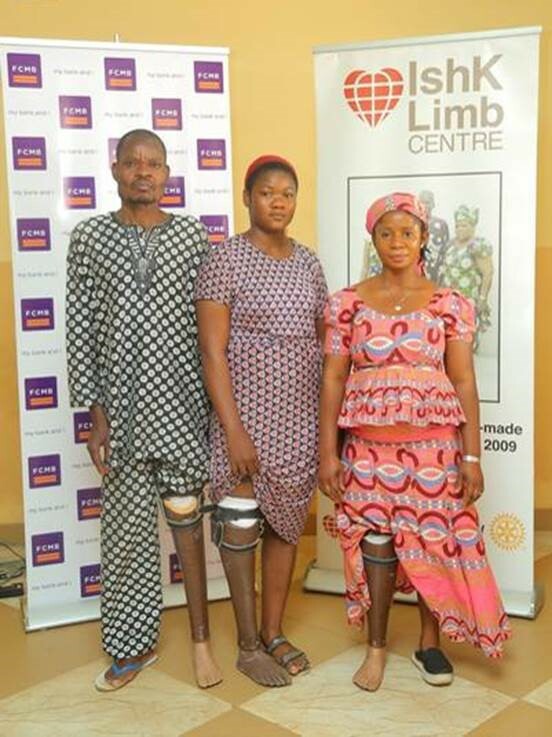 FCMB in partnership with the Ishk Tolaram Foundation (Limb Centre) donated 50 Artificial Prosthetic limbs to the physically challenged in Enugu State at a 2-day fitting exercise, training and event on August 29 and 30, 2018. The event which held in Aruike Specialist Hospital, Ebe, Udi LG in Enugu was led by the Deputy Governor, Enugu State, Hon. Mrs Cecilia Ezeilo. Also in attendance were the Commissioner of Health, Enugu State, Finton Ekuchin: The Founder, Spiritan Self Awareness Initiative-Father Charles Agada: Zonal Head, Enugu Zone, Chike Okeke: Head CSR and Sustainability, Omoniyi Iyanda: Regional Head PSG- South East & South South, Chijioke Mbagwu, amongst others. The initiative which is aimed at empowering the beneficiaries, provided a platform with new opportunities to the individuals to regain their confidence for a lifestyle which had been challenged by various limiting situations. This is in line with one of our CSR pillars – Poverty Alleviation. Indeed it was a great joy to restore people back to a meaningful existence. 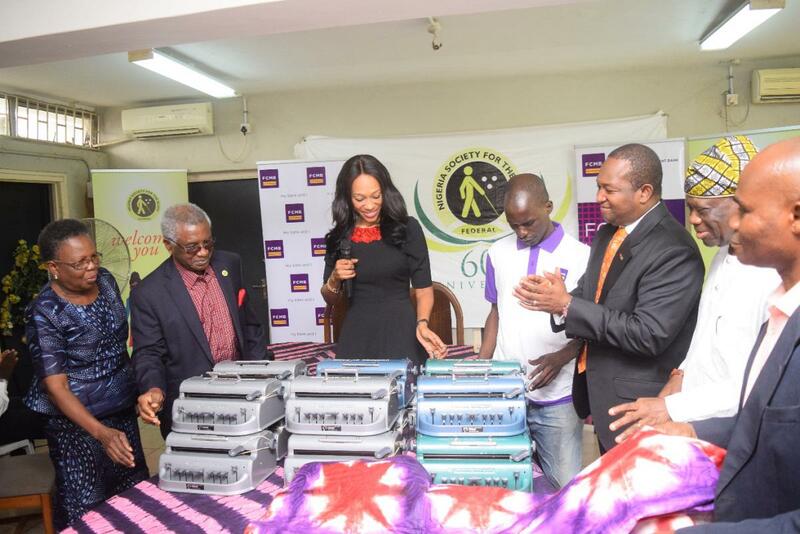 In line with its commitment to continually empower and impact lives in all segments of the society, First City Monument Bank (FCMB) Limited has donated 15 Braille machines to the Federal Nigeria Society for the Blind (FNSB) at its Vocational Training Centre (VCT) located at Oshodi, Lagos state. The Braille machines (comparable to a typewriter) are designed to aid the blind in reading and writing, with a view to assisting them get sound education. The donation of the machines forms part of the Bank’s Corporate Social Responsibility (CSR) initiatives, which focus on poverty alleviation, economic empowerment and environmental sustainability. The gesture is aimed at effectively supporting the efforts of the FNSB towards enhancing the standard of teaching, as well as learning of the blind, who are students of the VCT. The centre was established 60 years ago and so far, over 2,000 visually impaired men and women have benefitted from the various training programmes at the centre. In line with its commitment to continually impact lives in the communities where we operate, First City Monument Bank (FCMB) Women on March 8, 2016 visited and donated cash and various items to underprivileged widows in Lagos. The gesture is to assist the widows to start up small scale retail businesses in their respective communities, with the overall aim of enhancing the standard of living of the beneficiaries. The economic empowerment gesture was in collaboration with the Centre for Values in Leadership and formed part of the financial institution’s activities to commemorate this year’s International Women’s Day. The development further reinforces FCMB’s well-known value as a helpful organisation that supports the well-being of the less privileged in the society. The items donated to the beneficiaries, were cash, refrigerators, foodstuffs, beverages, soft drinks, writing materials, confectioneries, toiletries, among others. 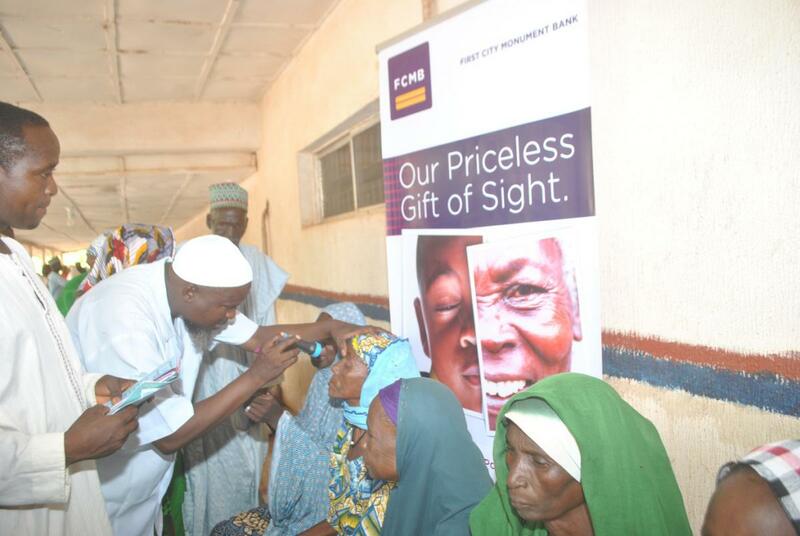 Under the Priceless Gift of Sight programme, FCMB partnered with the Tulsi Chanrai Foundation (TCF, a Nigerian-Indian not-for-profit organisation) for over six years, to alleviate the plight of disadvantaged Nigerians who would otherwise have lived with blindness and inherent poverty. In 2015, TCF through the help of some of its donors including FCMB was able to reach a milestone of 100,000 surgeries in Nigeria. In 2016, the programme was held in Kebbi and Cross Rivers with surgical intervention for over 400 beneficiaries. Over 100,000 people in remote areas of Nigeria have benefited from the programme since its inception in 2009. 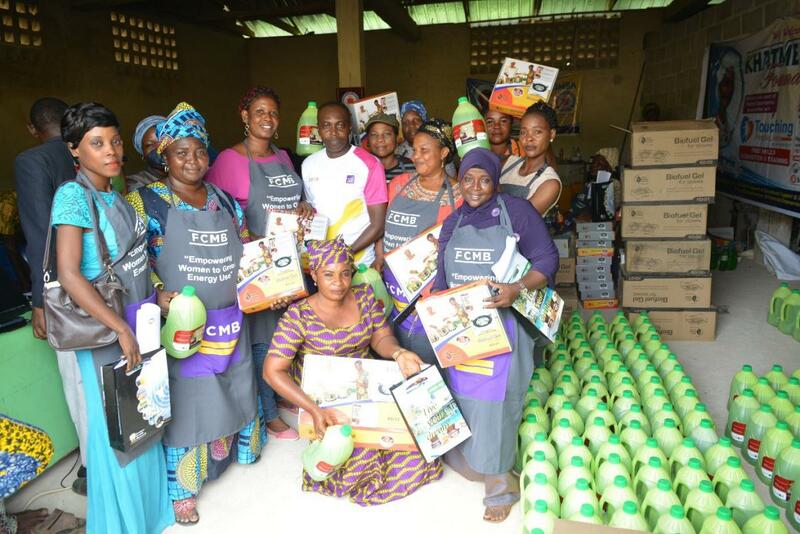 FCMB Empowers Women in Lagos to Green Energy Cooking. The event which took place in Ijede community of Ikorodu, saw the first set of 25 beneficiaries (out of 200 women trained) walk away with the bio-fuel gel powered cooking stoves and gels to trade with. Beyond the financial empowerment, the initiative also supports the improvement of health and welfare of these women, their families and the larger community. This is because the bio-fuel gel is affordable, readily available and much cheaper compared to other means of cooking. As well, when used for cooking, the gel generates fragrance proven to kill mosquitoes but harmless to man. FCMB in partnership with Sought-Out Cities Arts, Skill, and Empowerment Initiative (SOCASEMP), organised a Four-Week intensive training to empower 380 youths of Eti-Osa Local Government with vocational skills in: Arts, Catering, Music, Event and Decorations, Fashion Creation, Dance, Make-up Artistry, Wig Making, Web Designing and Digital Literacy. On Saturday, September 8, 2018, the final event and exhibition took place at Naptali Event Center, Sangotedo, Lagos. Beneficiaries took time and turns to express their gratitude for such a programme; cheering and chanting FCMB live on stage in appreciation of the Bank’s effort to help them achieve their dreams. Other eye-catching presentations such as arts and crafts, music, dance and comedy took the stage. Interestingly, the event was decorated and the guests were catered for by beneficiaries from the SOCASEMP initiative. The event ended with an award session, where beneficiaries across various departments received various award for their outstanding performances during the programme. A certificate of participation was also presented at the end of the programme. Mr. Lanre Olaleye- Senior HR Business Partner, Addax Petroleum and a guest at the event commended the SOCASEMP initiative and thanked FCMB for their continued support towards the empowerment initiative. The founder of SOCASEMP (Miss Eunice Okoh) also thanked FCMB for the opportunity provided to impact positively on these individuals and the lasting change made. As part of its commitment towards youth empowerment and sustainable economic growth, First City Monument Bank Limited, (FCMB) Limited kicked-off a capacity building programme for youths in Lagos tagged, “Empowered for the Future (E4F)”. The initiative is a 12-month peer-to-peer economic empowerment, sexual and reproductive health promotion project for in- and out-of-school adolescents. The financial institution organises this in partnership with a Nigeria-based Non-Governmental Organisation (NGO), Youth Empowerment Foundation (YEF). This initiative is also in line with the Bank’s Corporate Social Responsibility (CSR) agenda, which focuses on poverty alleviation, economic empowerment and environmental sustainability. The programme commenced in August with a week-long training session held at Eric Moore Senior Secondary School, Surulere, Lagos. 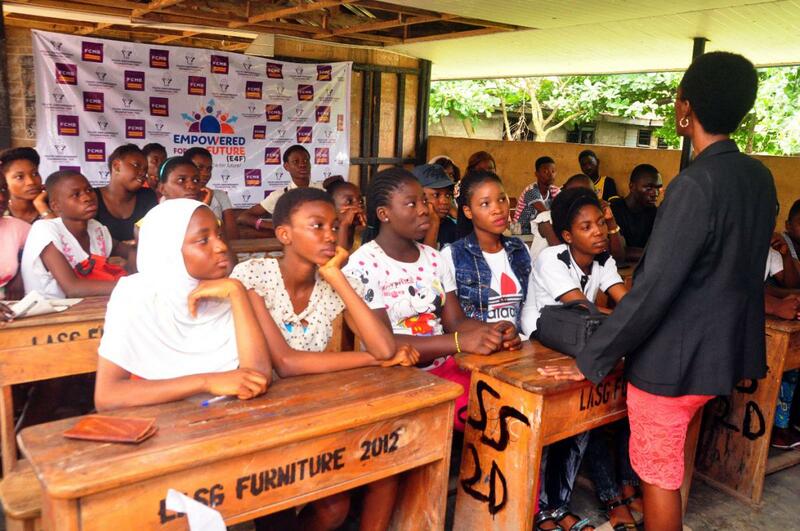 The exercise involved about 50 youths who were trained on various aspects of human development. The beneficiaries are expected to reach out to 750 peers over a one year period, with focus on financial literacy, skill acquisition, sexual and reproductive health, while undergoing vocational training, job shadowing and knowledge building programmes. FCMB Extends help to the Internally Displaced Women in Maiduguri. In the recent years, thousands of women and children have been made homeless, and driven out of their socio-economic activities due to insurgency in the North Eastern part of Nigeria. 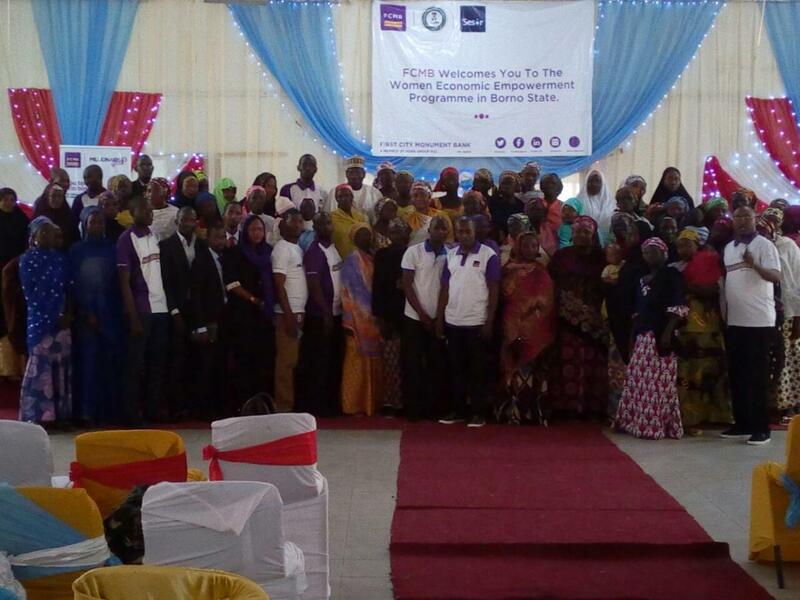 However, as part of the Corporate Social Responsibility (CSR) initiatives, First City Monument Bank (FCMB), in partnership with Sesor Empowerment Foundation, gave succour to some internally displaced women in Maiduguri, Bornu State, North East of Nigeria, under an economic empowerment programme aimed at alleviating poverty. The first batch of beneficiaries, 100 women in all, were given initial start-off funds by the Bank on October 20, 2016 at a ceremony in Maiduguri, for the establishment of small scale businesses. The gesture will help them cater for themselves and their immediate families. The beneficiaries also went through training, skill acquisition and other capacity building activities prior to the disbursement of the funds. In continuation of the Economic Empowerment/Environmental Sustainability programme we commenced last year October in partnership with Mitimeth on transforming water hyacinth to valuable materials, 60 residents of Epe town participated in the 10 days training programme co-ordinated by Mitimeth. 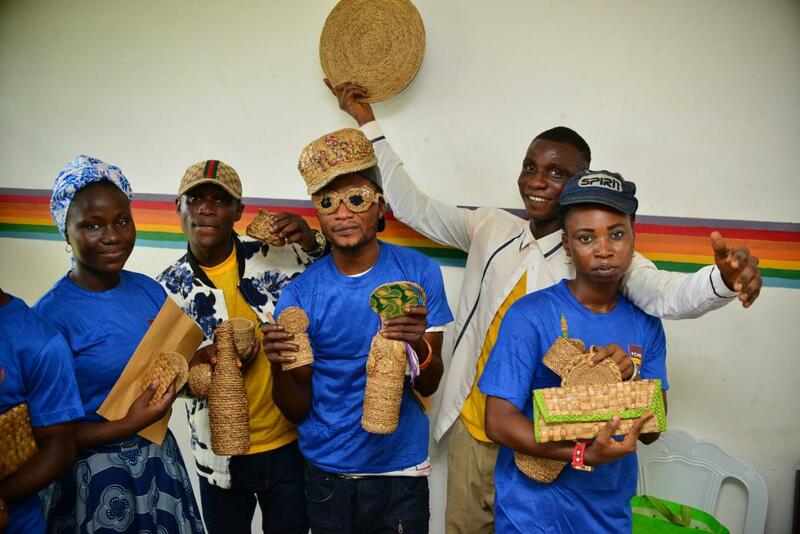 The participants were taught on how to convert invasive aquatic materials, particularly water hyacinths, to produce handicrafts such as table mats, baskets, vases women dressing accessories, mugs and other items for commercial purposes.This forms part of our Corporate Social Responsibility (CSR) initiatives. Last year, the exercise took place at Bayeku community in Ikorodu and had 40 participants who benefitted from the project and are now doing very well in the business. 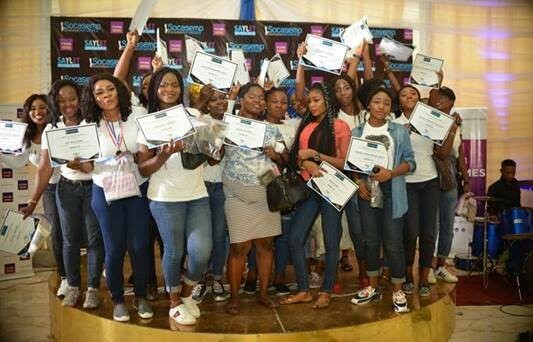 This year, we are happy to inform you that all the participants have successfully completed the training and are now well-equipped with the necessary skills to venture into the business. FCMB’s decision to sponsor this economic empowerment project is part of our environmental sustainability efforts to curb the menace of water hyacinths Infestation which is usually heavy on the waters surrounding Epe at various times of the year, negatively impacting livelihoods – transportation, fishing and health – in the area. With the new skills learnt, women and youths of Epe have been empowered to turn a disadvantage into a source of income. Indeed, our intervention was borne out of the Bank’s CSR mantra of, ‘’Teach a man to fish’’. With this capacity building and empowerment programme, we have been able to preserve the environment and empower people in this town to create additional sources of income, thereby reducing poverty. At FCMB, we will continue to innovatively devise means of converting challenges posed by the environment to opportunities. This is in line with one of our core values as a reliable and helpful financial institution. Additionally, we are committed to championing and supporting initiatives that will make our planet a safe haven for us and the future generation. FCMB has a long history of community and human development which it has continually implemented in several areas across the nation. We believe that humanity and the communities where we operate should benefit from our presence through contribution to sustainable development. In celebration of World Environment Day 2018, First City Monument Bank, the Nigerian Conservation Foundation and other environmental friendly organizations hosted an event to create awareness on the need to #BeatPlasticPollution. The event held at the Lekki Conservation Centre on Thursday, 7th June, 2018. 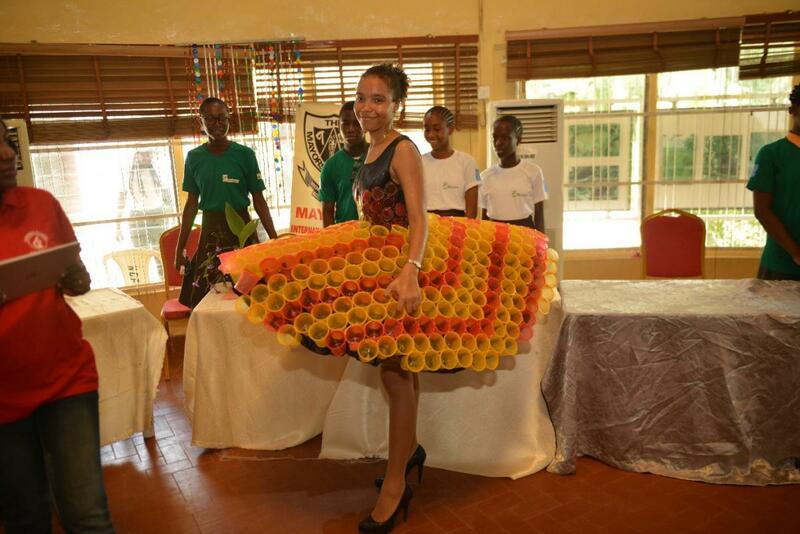 It was an exhilarating experience as 400 pupils from 20 school in Lagos participated in a highly competitive and innovative exhibition of beautiful items made from plastic (regarded as waste), with the slogan-“if you can’t re-use it, refuse it”. The educative and interesting program was designed to highlight to young Nigerians in their formative years the importance of taking proactive actions around recycling and on-cycling of plastics and plastic-related waste such as nylon. At the event, FCMB received Special Recognition for our support and contributions towards the 2018 #WED event. We remain committed to conducting our business in a sustainable way and executing initiatives that support preservation of the environment. Driven by its desire to checkmate cancer which has seemingly brought humanity to its knees, particularly in Nigeria, First City Monument Bank (FCMB), for the 3rd time in a row, is throwing its weight behind this year’s edition of the Nigerian Stock Exchange’s (NSE) Corporate Challenge in Lagos. 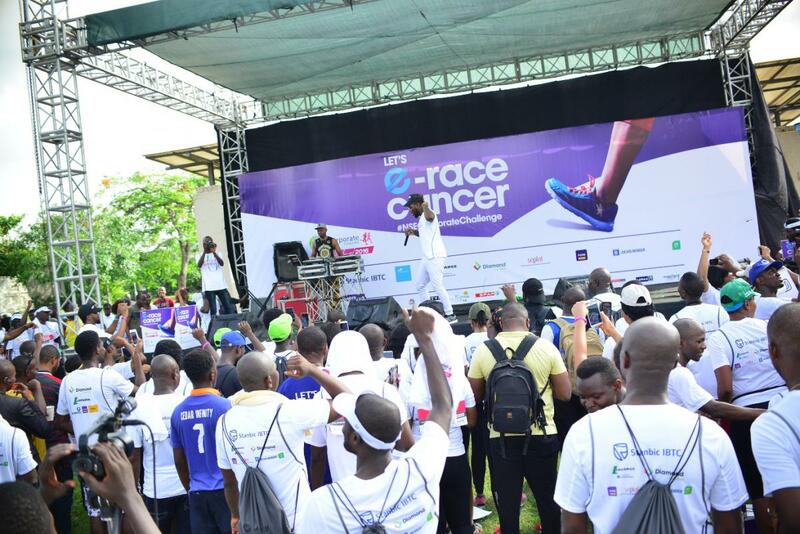 Themed “Erase Cancer”, the event is a call to action for Nigerians, especially corporate bodies, including over 100 listed companies and broker dealer firms in the Nigerian Stock Exchange whose representatives and staff are expected to participate in the 5kilometer walk, jog and run competition to stand against this menace. This initiative aligns with various aspects of FCMB’s corporate social responsibility and its strong belief in the Sustainable Development Goal which focuses on health for all. The main objective of the Corporate Challenge Competition is to raise funds. All proceeds from the competition are expected to be donated towards providing mobile cancer screening centers in Nigeria. Six Years Counting; FCMB has been a proud sponsor of the prestigious COPA Lagos. COPA presents a unique platform to project Lagos to a global audience. The tournament also promotes the values of sports, team spirit and healthy living amidst other exciting events. 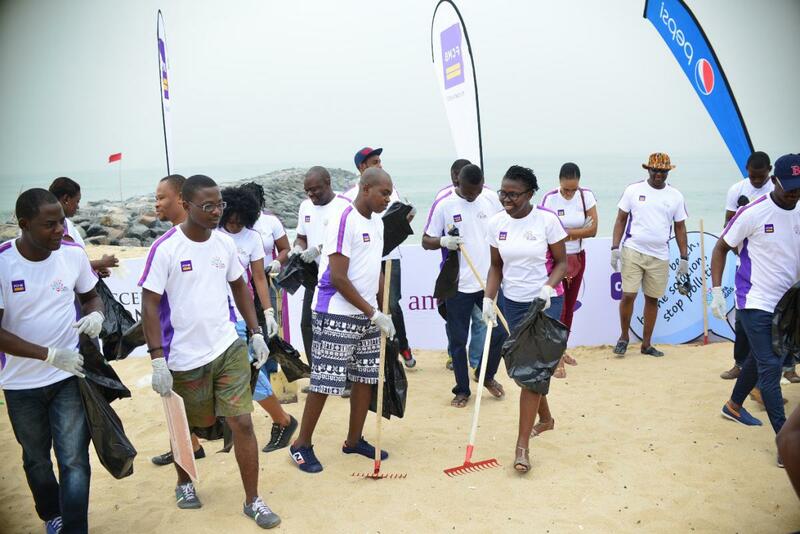 As part of our partnership, FCMB participated in the yearly Beach Cleaning at the Elegushi Beach in Lekki, Lagos. One of the largest volunteer-beach cleanup movements in Lagos, is aimed at drawing attention to the dangers of ocean pollution, its negative effects on health, wildlife and global environments. The Environmental Sustainability activity carried out by a good number of FCMB employees who volunteered to participate with a lot of excitement, was highly colourful and memorable. FCMB partnered with the Central Business District-CBD, through a Sponsorship request for 20 Cleaning staff/cleaners for the CBD-(Tinubu/ Marina axis). The CBD is characterized with a high influx of traders coming into this area for business transactions on daily basis. Hence, a huge amount of waste is always generated. Owing to this, the intervention of FCMB to support the Lagos State Government in sponsoring additional 20 sweepers to keep the environment tidy is a timely gesture. 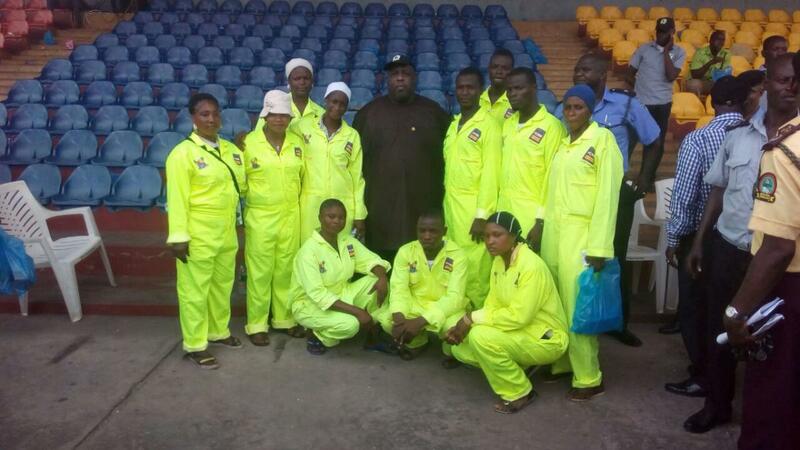 FCMB also donated apparels and tools to work with for all the sweepers. This initiative aligns with FCMB’s corporate social responsibility on Environmental Sustainability and its strong belief on a clean environment.